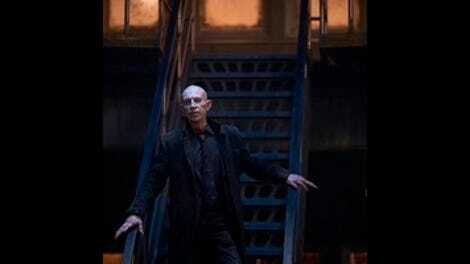 Long ago The Strain moved away from having any sort of meaningful thematic throughline, but now that the final season is underway, there seems to be a haphazard attempt at getting some sort of cultural or political point across. 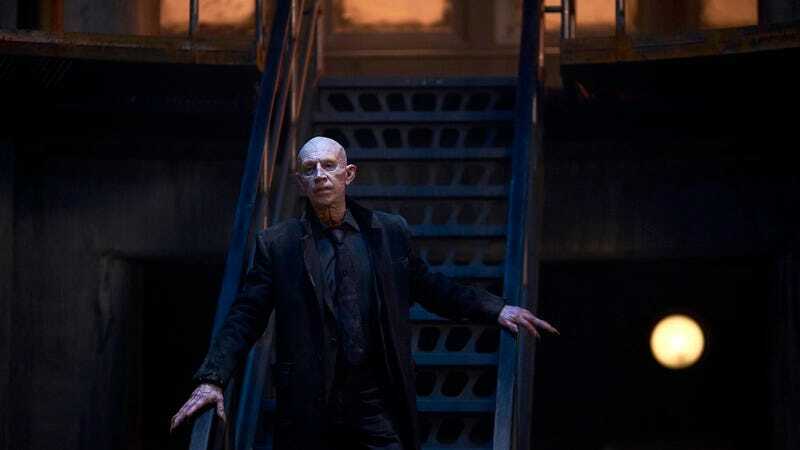 That said, it comes in the form of Quinlan saying that the strigoi haven’t caused the downfall of man and the planet, but rather human’s and their weapons have brought about their own destruction, which is just general enough to avoid being all that interesting. Fet, Charlotte, and Quinlan show up at the missile silo with their new army friend in tow, and it turns out that the strigoi have already been there. One man survived the attack, and he’s holed up inside the silo, protecting the missle and firing shots at Quinlan and Fet. That sends Fet inside to rescue Quinlan and, with any luck, retrieve the missile. The missile story is one of three in this episode, and if it wasn’t for emo Zach and his hormones, it’d be the least compelling. There’s just not much urgency to the storyline, despite how many times Fet underscores that the whole human race is relying on them getting this nuclear missile. Here, we know very little of the soldier they’re up against, and the whole subplot feels like The Strain spinning its wheels until it can get everyone a little closer together and fighting toward the same goal. It’s a running joke in these reviews and discussion posts that Zack is one of the worst characters of all time, but I think I’m starting to lose my sense of humor. I’m just so tired of the forced conflict that comes with any storyline he’s involved in. This week he’s growing closer to his maid, Abby, and it’s already becoming clear that The Strain is going to play out a romance angle, and I just can’t deal with it. Zack looks so young next to her, and I’m not convinced that this show can adequately explore Zack’s guilt, which is what the show is looking to do with the introduction of Abby. Her parents were killed by the bomb that Zack set off, and she’s also his peek into how everyone else is living in this world. Nuance is hardly The Strain’s strong suit, and that doesn’t bode well for this storyline. While the introduction of Abby gives me pause, I’m loving what Alex has brought to the table. She’s like a new version of Nora, pushing Eph to be better than his sadsack mood often allows him to be. Here’s hoping that she meets a better end, and is treated more kindly, than Nora before her. This week in on-the-nose symbolism: Zack and Abby musing on the state of the world while walking around the American Museum of Natural History. So, Eph’s plan to poison the blood supply of a strigoi nest ends up working perfectly, taking out nearly 2000 strigoi in one shot. There’s only one problem: that tips off The Master to their location, whereas before him and Eichorst had no clue where Eph was hiding out. It’ll be nice to get into the action of Eichorst and The Master going after Eph because, as of now, the dramatic tension is suffering because of how spread out the characters are. This is the final season, and we should be hurtling toward some sort of epic confrontation. There’s still plenty of time, but with Fet, Charlotte, and Quinlan off looking for a pit assembly for the nuke, and Dutch still locked away within The Partnership, it seems we’re still a long ways from any sort of meaningful conflict. In other words, it’s frustrating to not only have the main characters so isolated from each other, but also to have each episode therefore neglect moving certain stories forward. Going whole episodes without checking in on Dutch, Gus, or The Partnership contributes to the season’s lackluster pacing.